WHAT IS OHIO STATE ATHLETICS DEVELOPMENT? The office of Ohio State Athletics Development is the fundraising umbrella of Ohio State Athletics and provides a way for individuals and organizations to help our talented young people receive a quality education and competitive experience. The Ohio State University Department of Athletics is one of the most visible, respected and accomplished programs in the nation. 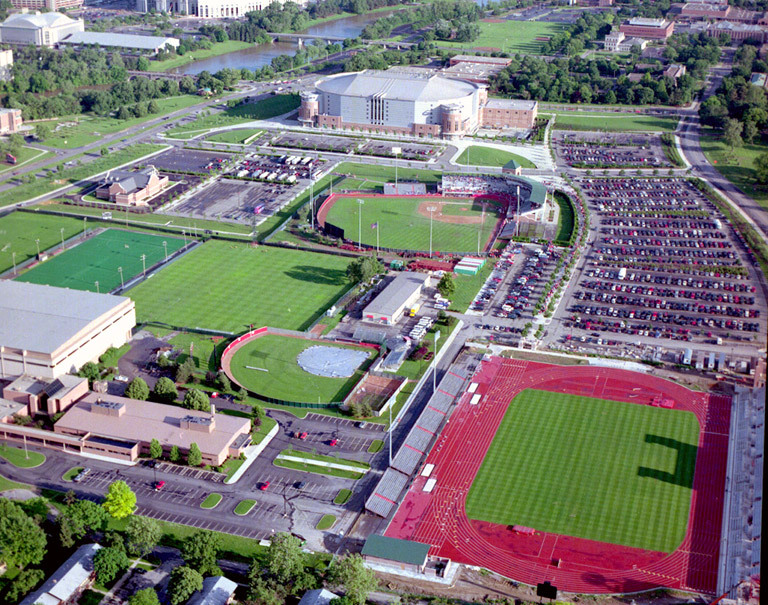 It ranks among the largest by two important measures – number of student-athletes (over 1,000) and number of sports (36). Remaining in the forefront of scholarship, innovation and intercollegiate competition requires an incredible commitment from a generous group of supporters. The Department of Athletics maintains totally self-supporting operations. All buildings and capital expenditures, including debt service, are funded by the department’s generated funds without subsidy from the university. No student fees, tax dollars or university funds are used to support the programs of the Department of Athletics. Without philanthropic support, the Department of Athletics would not be able to offer our young men and women an opportunity to earn a highly respected degree while competing at the highest level of intercollegiate sport. Ohio State Athletics Development serves to provide an unparalleled experience for our current, former, and future student-athletes by embracing and engaging a community of passionate supporters, establishing transformative commitments, and illustrating impact to encourage sustained philanthropy. The following list of questions and answers is intended to provide you with some general information regarding your involvement to Ohio State Athletics. Your contribution to the Department of Athletics may be utilized in a number of different ways to benefit the goals of Ohio State. Buckeye Club membership payments are used to cover the costs of athletic grant-in-aid provided to our student-athletes. Athletic grant-in-aid encompasses tuition, books, and room and board. Major gift and capital project contributions are used to create endowments that support our student-athletes, and to forward the overall goals of the department through the construction and renovation of athletic facilities. What are the deadlines for Buckeye Club members to qualify for football tickets and parking? Members renewing their membership must renew by February 5 each year. New members must join by April 30 each year. Will an annual membership guarantee me season tickets? Access to season football tickets is based on availability and thusly not guaranteed. However, based upon prior experience, we are confident that all Buckeye Club members who make their qualifying payment prior to the renewal or new member deadlines will have the opportunity to purchase season football tickets. How many tickets can I purchase if I am a Buckeye Club member? Buckeye Club members can qualify for as many tickets as they would like! Each Buckeye Club membership (with the exception of the All-America Level) qualifies for two (2) season tickets. Individuals may contribute towards multiple memberships to qualify to purchase of as many tickets as they wish. For details and restrictions, please see information about Buckeye Club membership levels. How is football seating determined? Full re-seating of Ohio Stadium occurs every four years, beginning with the 2016 season. Seat selection windows begin after all season ticket orders have been processed, and are assigned based on the priority point system. For more information about the seat selection process, please click here. How much are season tickets? For 2019, a full-season package costs $702. The cost for a pair of seats is $1,404. There is an additional $35 surcharge for postage and handling. Will I be able to keep my Alumni Association tickets? Yes. As a Buckeye Club member, you will still be eligible to enter the OSUAA ticket lottery. How much does a season parking permit cost? The following prices represented 2019 parking prices. Parking prices for future years are subject to change. Will I have access to basketball tickets with my donation to the Buckeye Club? There is no contribution necessary to purchase season basketball tickets. For more information, please click here.